Set in 2013, some 11 years after the events of "Patlabor 2 the movie", this series finds the SV2 just barely existing. With the completion of the Babylon Project a long forgotten memory and a lack of Labor crime due to the rarity of Labors, coupled with a deep and long recession, Division 1 has been disbanded in favour of a two Labor team. Shigeo Shiba (or just plain Shige to everyone) remains the only member from the original SV2. Everyone else has moved on. In fact this is the third generation of the SV2. Apart from having to deal with constantly remodelled AV-98 Ingrams and almost no spare parts to speak of, the members have to deal with mad bombers, giant monsters, hired killers, runaway military Labors and worse; their parent branch, the Security Bureau of the Metropolitan Police Department, who would prefer to see the whole unit shut down. Regardless, the SV2 continue on with their work. In March 2013 at the Tokyo International Anime Fair, Tohokushinsha Film Corporation (TFC), who had previously co-produced all of the Patlabor anime, announced that they would be producing a Patlabor live action project which took the form of a 12 part series comprising of 48 minute episodes and a 15 minute "Episode 0" prologue. The episodes were released as a seven part limited theatrical release. This was a similar release pattern to recent anime projects such as "Yamato 2199", "Gundam Unicorn", "Ghost in Shell: Arise" and "Code Geass: Akito the Exiled"; first a limited theatrical screening, a broadcast on pay satellite TV station Star Channel three weeks after and then a general home video release a month or so after the theatrical release (fans could acquire early copies of the BD and DVD versions if they went to the theatrical releases). The Episode 0 prologue was broadcast early on 8 March 2014 before it's theatrical release as part of a promotional push for the series. The total budget of the project was 2 billion yen and two full size (8 metre tall) AV-98 Ingram Labor props were built for the project at a cost several tens of millions of yen The series veers between manga-like slapstick (occasionally with some rather strange CG manga-like effects) and serious drama, though it is weighted more heavily on comedy side. Much of it parodies or satirises other film genres or even certain sections or elements of Patlabor itself. All of the main cast are essentially variants of the original anime cast and many themes and ideas from the Patlabor anime have been reused in this series including some sections of dialogue. Two of the episodes are practically live action versions of the anime TV episode counterparts. The series was not well received by fans and critics alike in Japan and in the western world. Home video sales for the series in Japan were rather mediocre with each volume selling around 3,500 copies. A 48 minute director's cut of episode 12 was released as a part of DVD and Blu-ray box sets of the series in December 2016. Akira Izumino is the first Labor pilot. She loves Labors, Police TV Dramas and is a genius gamer who enters a state of super concentration when "in the zone". The one thing she doesn't like is being compared to the first generation SV2 members. The character's name is a just a rearrangement of the kanji in Noa Izumi's name. Akira Izumino previously appeared in Oshii's 2011 light novel, "Shocking Upset: Metropolitan Police Special Vehicles Section 2 (Bankuruwase: Keishi-cho Keibi-bu Tokushu Sharyo Ni-ka)". Akira Izumino was also Noa's pseudonym in the "Red Labor Landing" TV episode. "Izumino is played by Erina Mano, a former pop idol previously associated with idol unit Ongaku Gatas, which was part of the "Hello! Project", itself an offshoot of popular idol group Morning Musume. Coincidently Mano was a member of the "Hello! Project" futsal team Gatas Brilhantes in 2007, while her character, Akira Izumino, also played in a soccer team in the 2011 novel in which she appeared. Mano has had a small number of acting jobs prior to this project including the film "Kai-Ki: Tales of Terror from Tokyo". Captain Keiji Gotoda (Toshio Kakei) is Captain Kiichi Goto’s successor. Like Goto he is resourceful and cunning. Because of these attributes he is considered to be like a reincarnation of Goto. Gotoda apprently means "He's Gotoh", which further implies that the entire cast in the this series are just clones of the original characters in the anime. Keiji Gotoda previously appeared in Oshii's 2011 light novel, "Shocking Upset: Metropolitan Police Special Vehicles Section 2 (Bankuruwase: Keishi-cho Keibi-bu Tokushu Sharyo Ni-ka)". Toshio Kakei has previously played Kentaro Shinjo in "Bayside Shakedown", Koichi Fukaura in "Space Travellers" and voiced Angel Benengeli in the anime film "Nasu: Summer in Andalusia". Yuma Shiobara (Seiji Fukushi) is Akira’s backup. He is a military otaku and can be found drinking on duty and making plastic models. Seiji Fukushi has previously appeared in the live action versions of "Nodame Cantabile" and "Touch", as well as the feature film "Swing Girls". Ekaterina Krachevna Kankaeva (aka Kasha, played by Rina Ota) is a Russian officer on loan from the Federal Security Service of the Russian Federation to train with the SV2. She is back up to the second Labor. She is a chain smoker, backchats everyone in Russian, owns an AK-47 and rides a Ducati bike. Rina Ota has previously had a small number of acting roles such as a guest part in "Neo Ultra Q" and the role of Kazuko "Lady Jane" Matsui in the film "69". Shigeo Shiba, (played by Shigeru Chiba, who voiced the original character in the anime) or just plain Shige to everyone, is seemingly the only surviving member of the original SV2. He took over Seitaroh Sakaki’s job as head mechanic sometime before "Patlabor 2 the movie". Shige was previously second in command of the mechanics at the SV2. He is a man that is truly dedicated to his work, though sometimes he can go overboard. He is a proud member of the SV2, and makes sure the Labors work perfectly. Shige appeared in all version of the anime except the third movie. Shige is played by Shigeru Chiba who is best known as the narrator of "Fist of the North Star", Megane in "Urusei Yatsura", Garlic Jr in "Dragon Ball Z" and Buggy the Clown in "One Piece". He also stared in Mamoru Oshii's first three live action films. Isamu Ohtawara (played by Yoshinori Horimoto) is the pilot of the second Labor. Ohtawara is an alcoholic which almost got him fired from his job in the past. He is a gung-ho violent, trigger happy cop who is merciless to criminals. His official profile says his special ability is drunken boxing. Horimoto recently starred in the TV series "Shuriken Sentai Ninninger". Shinji Mikiya (played by Kohei Shiotsuka) is the driver for the second Labor Carrier. He is divorced from his wife and pays alimony through his winnings from playing pachinko, which ironically was the reason his wife left him in the first place. He is obsessed with data and his official profile sates he previously worked as a computer programmer and that he was almost dismissed from his post because of his illegal actions when playing pachinko. Due to his negative attitude he is unsuited for Labors piloting or being a backup, therefore he is in charge of the Labor Carrier. Hiromichi Yamazaki (played by Shigekazu Tajiri) is the first Labor team's carrier driver. He is a shy, tall man who is obsessed with taking care of his chickens. He can be come quite emotional and cry at times and is probably totally unsuited to working at the SV2. Yoshikatsu Buchiyama played by Yoshikatsu Fujiki) is second in command of the mechanics. He admires the head mechanic, Shige, greatly and generally gives orders to the mechanics while Shige oversees everything. He can always be found carrying a bamboo sword and wearing geta. Yoshikatsu Fujiki has previously played Inui in Mamoru Oshii's live action film "Stray Dog: Kerberos Panzer Cops" and Kazuki Fuse in the anime film "Jin-Roh". Mamoru Oshii was chief director of the series. Takanori Tsujimoto ("Bushido Man"), Kiyotaka Taguchi ("Neo Ultra Q") and Hiroaki Yuasa (director of photography for "Assault Girls") were episode directors for the series. Oshii and Kei Yamamura wrote the screenplays for the episodes. Omnibus Japan produced the special effects. They are company well known for the late night tokusatsu series "Garo". Cinema Sound Works are credited with sound recording and special effects company Dummy Head provided "special makeup design". Kenji Kawai wrote and performed the music for the series. Hong Kong company Panorama has released the series on Blu-ray and DVD. The discs include the original Japanese dialogue, a Cantonese dub and English and Traditional and Simplified Chinese subtitles. The DVDs and Blu-rays are only available in Hong Kong, and therefore will only work on NTSC compatible and region 3 compatible DVD players and region A Blu-ray players. If you don't live in Hong Kong, check your DVD or Blu-ray player's instruction manual to see if it will play them) Please see the English Language Live Action Releases Video List for a complete listing of all releases, formats and product specifications for this series. This series is available as single DVD and Blu-ray discs as well as DVD and Blu-ray box sets in Japan from Happinet Pictures. These DVDs and Blu-rays do not come with English subtitles or an English dub. The DVDs and Blu-rays are only available in Japan, and therefore will only work on DVD and Blu-ray players that are both NTSC compatible and will play region 2 DVD discs (the Blu-rays are region free - if you don't live in Japan, check your DVD player's instruction manual to see if it will play the discs). Please see the Japanese Live Action Related Releases Video List for a complete listing of all releases, formats and product specifications for this series. A GWEI Product. ©2003 - 2018 GWEI. 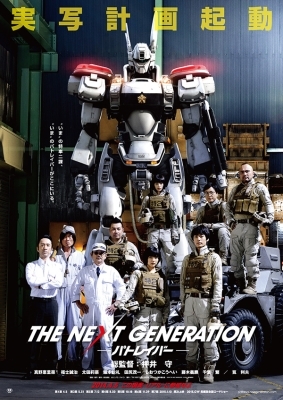 The Next Generation - Patlabor - ©2014 - 2015 Headgear/The Next Generation - Patlabor Production Committee. All other logos/trademarks are copyright of their respective owners/companies. Used for review and illustration purposes only.